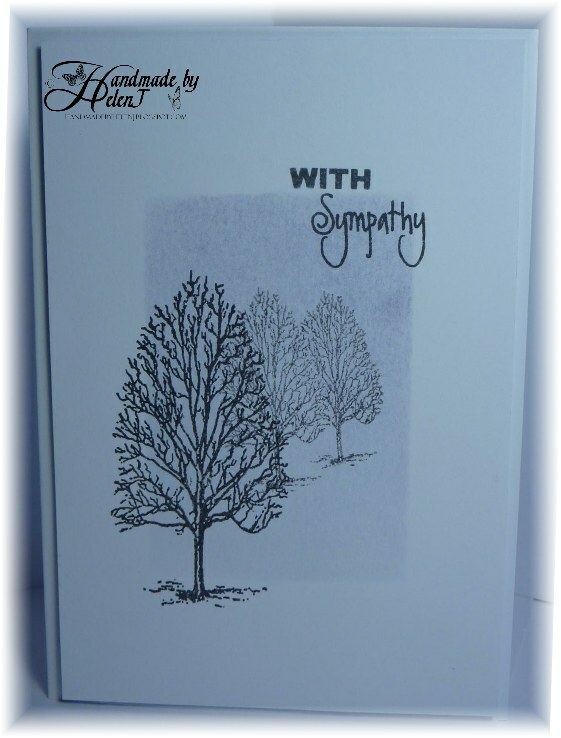 This is the first of 2 sympathy cards I’ve done recently, and as the main recipient is a man I wanted to avoid it becoming too feminine. This card is about as simple as it gets: I masked off a rectangle in the middle of the card front, brayered some Adirondack ink then removed the masks. As the card is quite porous, so not normally used for brayering, it came out quite patchy but that was the effect I was after (honestly!). Some Inkylicious trees, a simple sentiment and it was done. Ink: Adirondack Eggplant & Memento Tuxedo Black. 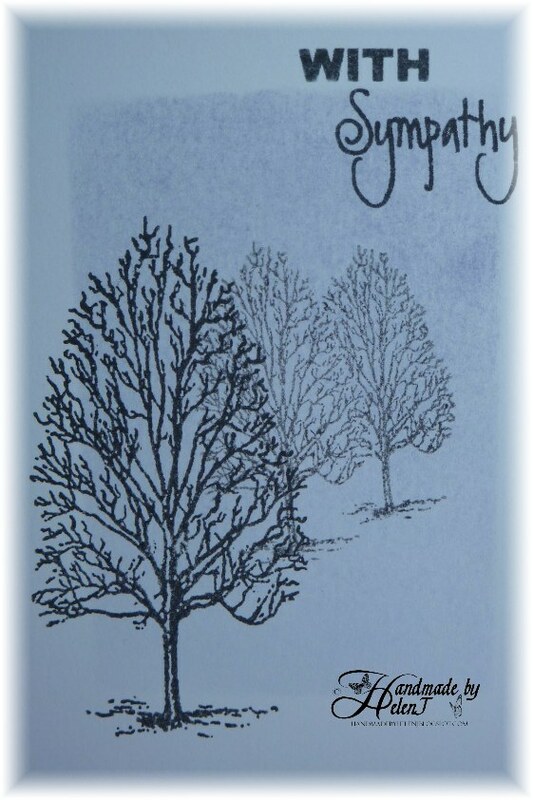 Stamps: Inkylicious Flight of Dreams (trees), Elzybells Greetings (no longer available). Ever had one of those crafting projects where everything that can go wrong, does go wrong? Yes, of course you have! This was one of those kind of projects for me. 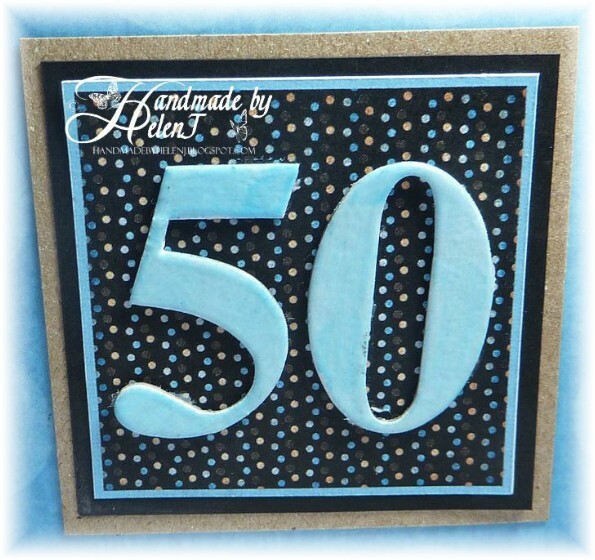 The only thing I knew when I started to make this card was how I wanted the number 40 to look. 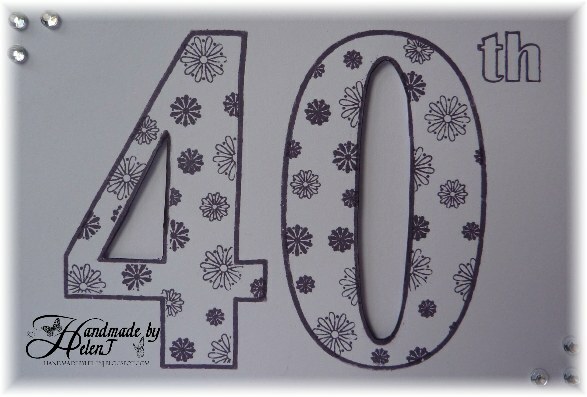 The number stamps are by Papermania; I masked them off & used stamps by Paula Pascual to create the flower pattern. 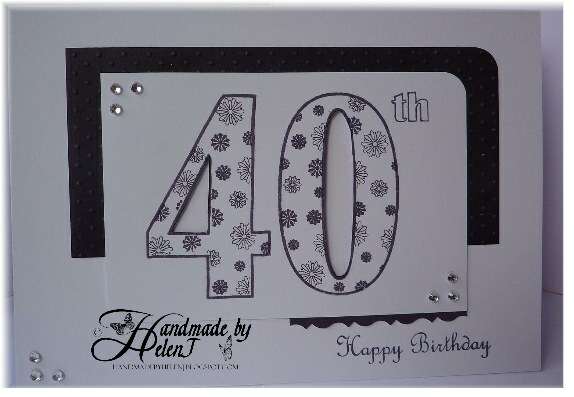 So far so good, until I tried to remove the masks in the centre of the numbers – I’d used temporary spray adhesive by Crafters Companion and when I took the masks away, off came some of the surface of the card, too. Not to be deterred, I used my craft knife to cut out the centre of the numbers. 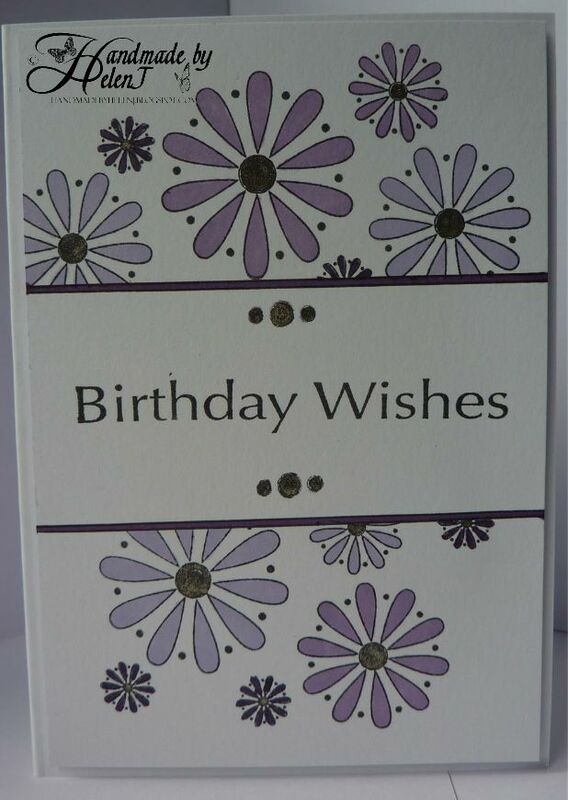 Once that was done I still had no idea of how I wanted the finished card to look, until I spotted this gorgeous card with a really unusual layout. My next problem was that I had no card to match the Memento Elderberry ink I’d used for stamping, so I dug out some Neenah card which I’ve found to be pretty much useless for everything & found that it’s also pretty much useless for directly applying lots of ink to, as it dries very patchy. Eventually I got it to the stage where I was happy with it, so I let it dry then ran it through my Cuttlebug with a Swiss Dots folder to add some texture. I decided some bling was definitely required & this is where I had my final problem – the Papermania Adhesive Jewels that aren’t. Adhesive that is. I eventually managed to find enough that were sticky and decided that I wouldn’t tempt fate by trying to add anything else! The CD wallets are stored in cheap IKEA DVD boxes. When I eventually get a craft room (sometime in the next century, probably!) I’ll buy some prettier ones! The boxes are marked A, B, C etc then the stamp wallets are numbered A1, A2, A3 etc like the one above. You can see that I’ve noted the wallet it’s stored in, the stamp manufacturer & product code if I know them. 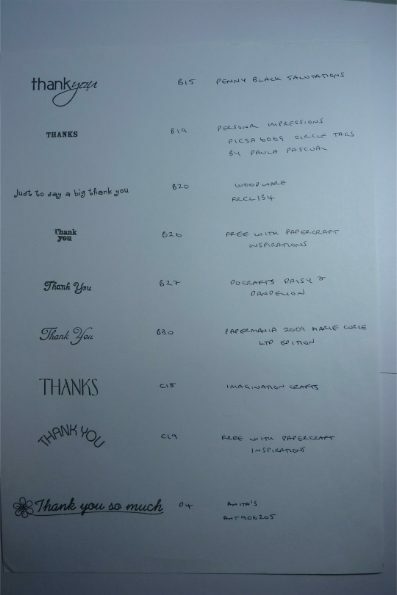 The sheets are filed in categories – the top one is filed in Floral Borders, the bottom one in Greetings. 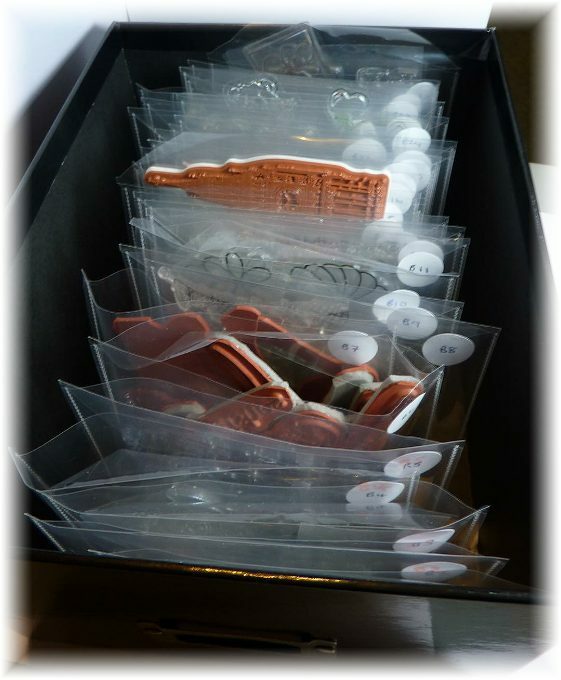 Wooden stamps were unmounted to save on storage space. The only stamps I haven’t done this with are large background stamps, alphabet & number sets as that was just a step too far! Organising this lot was undoubtedly one of the most boring craft jobs ever but it means that I waste a lot less time looking for what I want. An unexpected bonus is that it makes me see my stamp collection in a different way. It’s hard to explain, but although a set of stamps will be stored together in one or two CD wallets, I might split them into different categories. 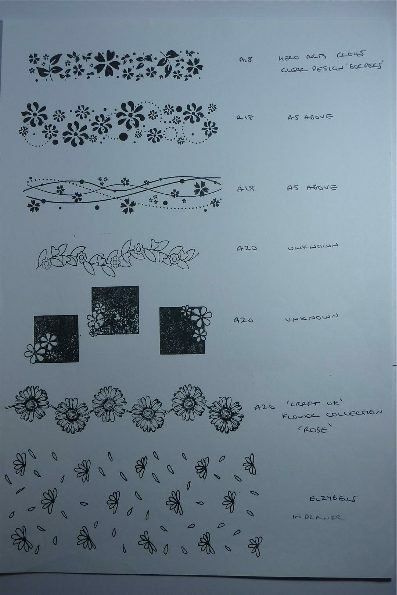 For example, a set might contain floral border, foliage & bird stamps – each would therefore be categorised separately so when I come to use them I might end up choosing the floral border from one set & the birds from a different one. If you’re still awake at this point I hope you’ve found it useful! I only discovered yesterday that this type of card is called a joy-fold card; I’d seen them before but never made one before. 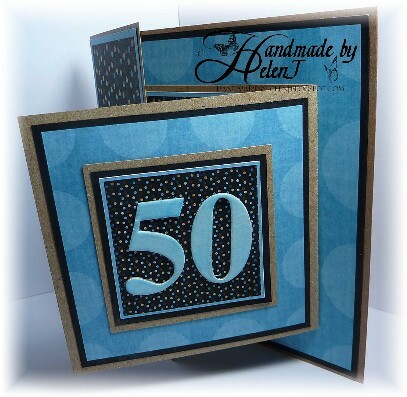 This card is for a good friend, our son’s Godfather, who turns 50 next week. 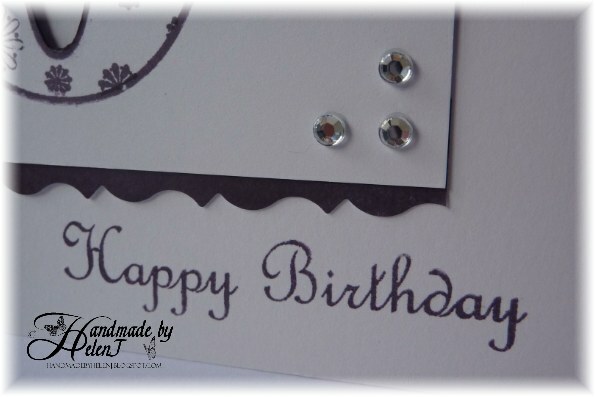 The backing papers were a freebie and I used Craft Artist 2 Professional to print out just the sizes I needed with borders to match – it saves a lot of printer ink to do it this way! 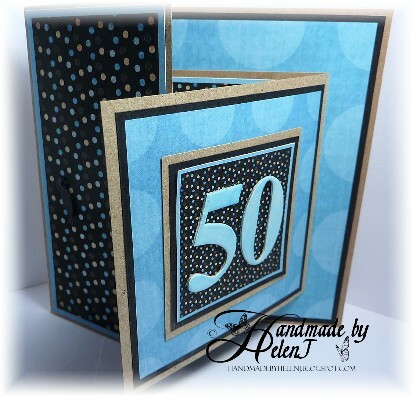 The techniques used on this card inspired me to do something similar. 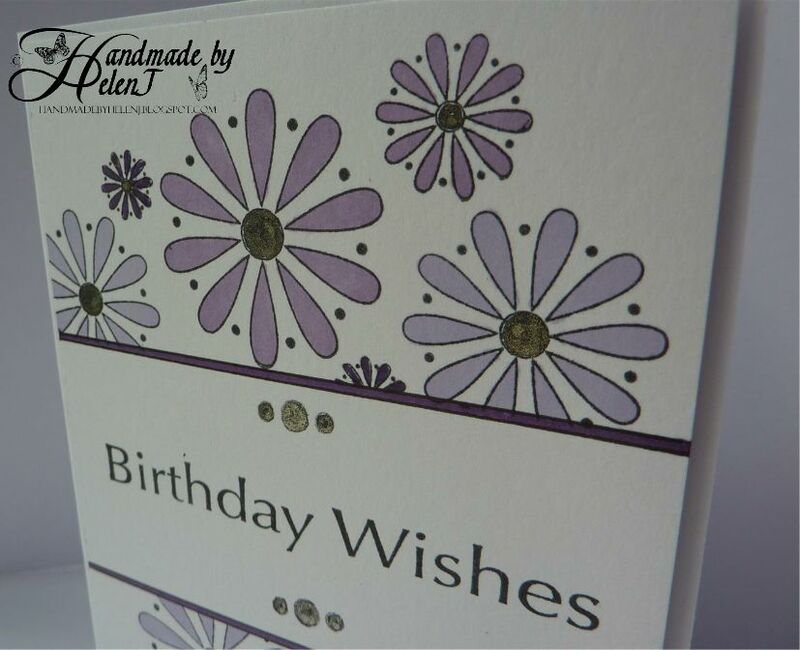 I used a set of stamps designed by Paula Pascual, masking the central panel, then coloured the flowers with Promarkers. I hadn’t been drinking when I took this first picture, honest! I coloured the centre of the flowers with a Sakura Stardust pen to add a bit of subtle bling but unfortunately it’s so subtle it doesn’t really show in the pictures! The main image was mounted on foam pads to finish.